The second single released in the UK is "Cosy Prisons".The UK single features a new mix of the song which was worked on by Magne and Dave Bascombe and is available in 2 formats, a 2 track CD single and picture disc. The cover of the CD is silver with a black and white shot of the band (Paul, Morten, Magne) with red and white arty leaves behind. There are also some white arty birds printed across the picture. The a-ha logo is printed in red up the right hand side of the sleeve with "Cosy Prisons" in black above. The inside of the insert is silver with more of the red and white leafy designs. Track information is printed in black in the bottom right hand corner. The disc is silver with white and black leafy designs. Track information is printed at the bottom of the disc in white. The CD single features Cosy Prisons (radio mix) (3:59) and The Sun Always Shines on TV (BBC Radio 2 Ken Bruce session) (5:19). 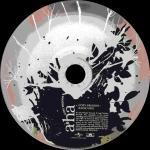 The design of the picture disc is very similar to the front and back of the CD insert, although the a-ha logo are printed above the picture on side 1. In addition to the radio mix of "Cosy Prisons", the picture disc also features Stay On These Roads (BBC Radio 2 Ken Bruce session). There is also be an "iTunes exclusive" of Cosy Prisons (BBC Radio 2 Ken Bruce session) which can be downloaded from the iTunes website. The cover of the 1 track promo is almost identical to the regular release, but has "For promotional use only. Not for resale" printed on the sleeve. The promo features only the "radio mix" of Cosy Prisons. Some copies of the promo come with a white square sticker on the front of the case with a red Polydor logo and release date of 17th April, contact number and e-mail address. Other copies have a white rectangular sticker on the back case with the text "A-HA COSY PRISONS OUT 17TH APRIL" plus some history of the band information and contact information. Polydor UK made available the "Blacksmoke Remix" (4:31) of "Cosy Prisons" as a free download through a-ha.com. The single was due to be released in Germany on 21 April, but the release was cancelled. However, the single was pressed and copies do exist. The cover is very similar to the UK release, but the logo on Morten's T-shirt is missing! It features the "Radio Version" (3:58) of "Cosy Prsions"; the live version from the Ken Bruce session (4:04); the "Original Cosy Demo" (4.07) and "Birthright" live on Radio Clyde (4:32). It also includes a desktop Player with "Cosy Prisons" video and picture gallery. Two tracks are available for download from the German iTunes website, they are "Cosy Prisons "Aural Float Remix" (5.51) and "Inhale Blacksmoke Exclusive Version" (4.22) of "Cosy Prisons". There is a one track promo CD by Polydor which comes in a jewel case white paper insert with black titles. The disc is silver with black text. It features the Radio Version (3:58).